Connecting with today’s crazy-busy prospects is tough and online meetings are rapidly taking the place of in-person meetings. Nailing It! 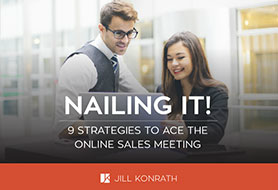 can help you get a competitive edge by helping you ace the online sale meeting.